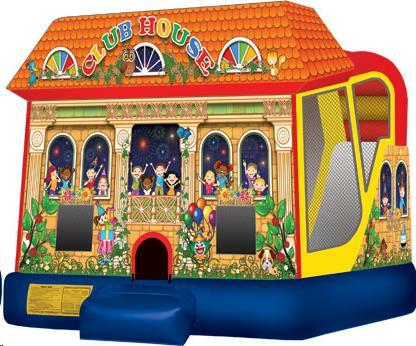 This Club House Combo bounce house offers up to four different activities for endless hours of activity. Features a large interior jumping area and a basketball hoop for group interaction, and high-visibility mesh allows spectators to keep an eye on participants. This combo jumper comes with a climb to conquer with a fun and fast slide, entertainment for even the most active child! Each bouncy house is manufactured with lite n strong , fire resistant vinyl for safety, durability and portability for any indoor and outdoor party. RENTAL PRICE INCLUDES LOCAL DELIVERY, SETUP (ON GRASS), TEARDOWN, AND PICKUP WITHIN 15 MILES FROM OUR STORE. ADDITIONAL DELIVERY AND PICKUP FEES APPLY FOR LOCATION OUTSIDE 15 MILES. **NOTE= UNIT MUST BE SET UP WITHIN 10' OF OUTDOOR GROUNDED OUTLET, ON LEVEL GROUND, AND STAKED INTO GRASS. IF EXTENSION CORD IS NEEDED, YOU MAY USE AN OUTDOOR HEAVY DUTY (MAX LENGTH 50"!!) EXTENSION CORD; AVAILABLE TO RENT (NOT PROVIDED). GENERATORS AVAILABLE TO RENT IF NEEDED. COMBO UNIT MAY BE USED "WET" DURING APRIL-OCTOBER, CUSTOMER RESPONSIBLE FOR PROVIDING THEIR OWN WATER HOSE AND WATER SPIGOT. ** includes (4) stakes and (1) blower. * Please call us for any questions on our club house wet/dry/slide/bouncer combo rentals in Rocky Mount and Wilson NC.